Time for another Read Aloud Thursday. Usually I post my RAT posts over at Reading My Library in conjunction with that challenge. However, I still haven't made it to the library with three kids in tow and I make absolutely NO promises that that will happen anytime soon. So, since we do still read-aloud, I'll just share whatever books we've been reading from our home library. It's convenient to get to those books! Meet our newest friend: Poppleton. 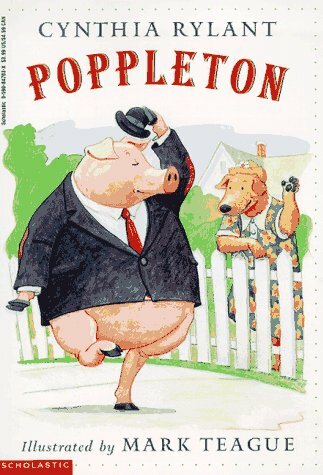 Poppleton, as you can clearly see from the cover art, is a pig. Illustrated by Mark Teague, he is fun to look at. Named by Cynthia Rylant, his name is fun to say. We like him. Very, very much. These books are marked for ages 4-8 and we fall right into that category. I found the first book in the series, Poppleton, at Goodwill and picked it up to test it out on Bookworm1 (age 4 1/2.) In this story we meet Poppleton who moves to a small town and rather begrudgingly makes friends with his neighbor, a llama by the name of Cherry Sue. Cherry Sue is a very friendly sort, inviting him over for breakfast, lunch and dinner every single day. He doesn't really want to go over every day and it turns out she doesn't really want to host every day. But it felt like the neighborly thing to do. They sort these issues out (through some mild irritation) and fall into a comfortable friendship. Each book has three chapters in it, each focused on a different story. They are labeled "Level Three" readers by Scholastic and read similarly to Frog and Toad, by Arnold Lobel. 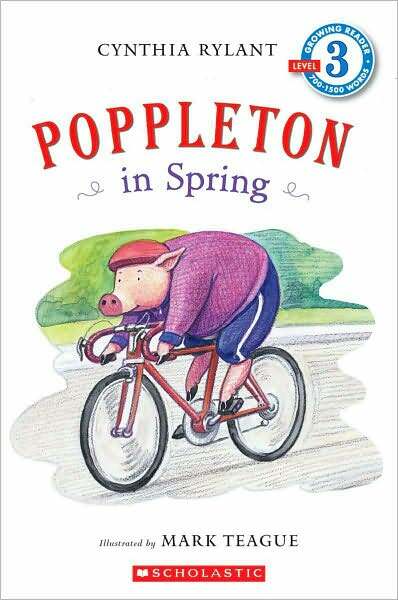 (If you like Frog and Toad, me thinks you will love Poppleton!) His friends are memorable as well with Cherry Sue being the most constant. Journey with him as he does his spring cleaning, takes a trip to the library and suffers from the common cold. We really like this particular pig and highly recommend him to you. I'm super excited about him and I think Bookworm1 will be excited as well when he sees the new Poppleton book which will be arriving in our mailbox any day now. (It's true! I cannot resist this pig!) 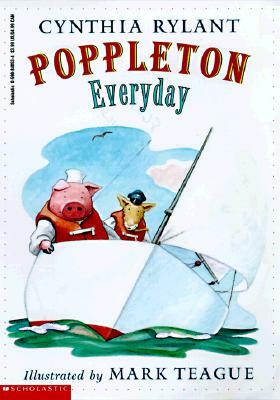 Check out these Poppleton titles: Poppleton Everyday , Poppleton Forever , Poppleton Has Fun , Poppleton And Friends , Poppleton In Fall , and Poppleton In Winter . We trust you will enjoy. 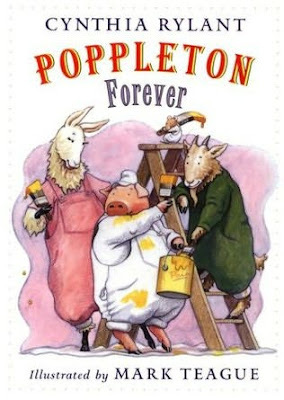 Oh, we adore Poppleton! (And the other Rylant reader books..Henry and Mudge and Mr. Putter and Tabby). My middle son's real name is the same as one of Poppleton's friends (hint..it's the mouse :)) so he especially loves reading these. For whatever reason, I'm not drawn to pig books. I'm not sure why...maybe because there was a pig farm on the outskirts of town when I was growing up and the smell was not so nice. But, I've never read Poppleton so maybe the series would change my mind about pigs? I love the cover art on this series of books, so bright and colourful, it can't fail to cheer either adult or child. The name 'poppleton' is a fantastic choice as well, one which a child would probably find quite funny to keep saying and certainly not a book that is likely to be put aside and forgotten about. Very astute of the author!